If VAT has been paid on expenses within the European Union (EU) after 1 January 2015, the invoices should be gathered and sent to our office as soon as possible in order to meet the June 2016 VAT filing deadline. The filing preparation has to start as soon as possible due to the IRS certificate that has to be ordered which can take up to 3 months to receive. Please contact our office at your earliest convenience if interested in proceeding with a VAT refund. Individuals sell items through eBay on a daily bases, however, many are unaware that they have already crossed the fine line from non-commercial to commercial sales activities. There was a recent court case in Germany where the Finance Court handled the case of an eBay seller generating amounts of about EUR 20,000 and up annually through acquisitions and sales from a coaster collection inherited from his father with an estimate of about 320,000 pieces. It was estimated that he generated 20% profit of total revenue and was therefore assessed VAT by the revenue office. The decision of the Finance Court demonstrates that auction platform sellers can be considered businesspersons even when selling private items. Therefore, when making multiple sales on platforms like eBay, it is extremely important to seek advice ahead of time to determine whether the sales are considered non-commercial or a commercial business activity, and the VAT liabilities that come into play when the fine line is passed. The deadline for filing a VAT refund claim to the United Kingdom’s tax authorities for invoices dated from July 1, 2014 through June 30, 2015 is fast approaching. Please contact our office as soon as possible if interested in proceeding with a UK VAT refund. The filing preparation has to begin 3 months before the December VAT filing deadline because an IRS certificate has to be ordered, which can sometimes take up to 3 months to receive. The Spanish government has decided to refund VAT on some of their services to non-EU entities as of January of this year. This is a major breakthrough since Spain previously did not refund VAT 13 Directive to North American companies. Some of the expenses on which VAT will be refundable are services related to the attendance of fairs, congresses and expositions of commercial or professional events. Related services include event access, accommodation, meals and transportation. Please contact our VAT experts for further information. Several U.S. companies doing business within the EU, including Germany have indicated that they have been contacted by the German tax authorities. They are apparently attempting to catch any foreign company selling digital services (on-line games, music, cloud services, and other) to private people within the EU. These companies are often unaware that they are required to register for VAT and charge VAT to the private customers. The call from the German tax authorities might come as an unpleasant surprise since they demand that the company declares and pays in the VAT due from sales to Germany. If this is not done the North American company can expect back taxes and penalties. To find out if your company is required to register and charge VAT within the EU, please contact our VAT experts. If VAT has been paid on expenses within the European Union (EU) after January 1, 2014, the invoices should be gathered and sent to our office as soon as possible in order to meet the June 2015 VAT filing deadline. The filing preparation has to start as soon as possible due to the IRS certificate that has to be ordered which can take up to 3 months to receive. Please contact our office at your earliest convenience if interested in proceeding with a VAT refund. In previous years Denmark only refunded a portion of the 25% VAT incurred on hotel bills. The Danish government has now decided to refund 100% of the hotel VAT starting January 1, 2015, which is up from 75% in 2014. This will save business travelers who file VAT refunds an additional 6.25% of the hotel costs. The Luxembourg government will raise its standard VAT rate from 15% to 17% on January 1, 2015. The reason behind the increase is to compensate for the changes in the VAT rules on B2C electronic services which Luxembourg dominates. The French government has decided to change their import system as of January 1, 2015. In most other EU countries, including France, import VAT is due to be paid to customs upon import. However, the new rules mean that France will now have the same import system as Belgium and the Netherlands, where a company can set it up so that the import VAT does not have to be paid out to customs. Instead the company accounts for the VAT in their upcoming VAT return. This will improve a company’s cash flow since no VAT has to be paid out and therefore also does not have to be claimed back at a later point. Please contact our VAT experts for further information. The deadline for filing a VAT refund claim to the United Kingdom’s tax authorities for invoices dated from July 1, 2013 through June 30, 2014 is fast approaching. Please contact out office as soon as possible if interested in proceeding with a UK VAT refund. The filing preparation has to begin 3 months before the December VAT filing deadline due to an IRS certificate that has to be ordered which sometimes can take up to 3 months to receive. The Japanese government has decided to increase their standard JCT (VAT) rate from 5% to 8% today, April 1, 2014. There might be an additional increase from 8% to 10% in October 2015. If VAT has been paid on expenses within the European Union (EU) after January 1, 2013, the invoices should be gathered and sent to our office as soon as possible in order to meet the June 2014 VAT filing deadline. The filing preparation has to start as soon as possible due to the IRS certificate that has to be ordered which can take up to 3 months to receive. Please contact our office at your earliest convenience if interested in proceeding with a VAT refund. New implemented rules within the EU means stricter requirements on eligible invoices accepted for VAT filings and refunds. Please contact our VAT experts for further information. The French government has confirmed that their standard VAT (TVA) rate will increase from 19.6% to 20% on January 1, 2014. The deadline for filing a VAT refund claim to the United Kingdom’s tax authorities for invoices dated from July 1, 2012 through June 30, 2013 is fast approaching. Please contact our office as soon as possible if interested in proceeding with a UK VAT refund. The filing preparation has to begin 3 months before the December VAT filing deadline due to an IRS certificate that has to be ordered which sometimes can take up to 3 months to receive. Several of our customers have indicated that Amazon within the EU will now require all North American companies that are planning to sell goods through Amazon in the EU to register for VAT before a contract is signed with any of the Amazon websites within the EU. Please contact our VAT experts for further details. Denmark will increase hotel VAT refunds starting January 1, 2014. Denmark will refund 75% of the hotel VAT, up from 50%. This will save business travelers who file VAT refunds an additional 6.25% of the hotel costs. The Italian government has decided to increase their standard VAT (IVA) rate from 21% to 22% on October 1, 2013. Croatia will become the 28th European Union (EU) member state on July 1, 2013. Euro VAT Refund, Inc. receives the "2013 World Trade Week Service to World Traders Award"
From Left: Gary Toebben, President & CEO of the Los Angeles Chamber of Commerce, Noel Massie, President, UPS, Central California District, Britta Eriksson, CEO, Euro VAT Refund, Inc., Julie Anne Hennessy, U.S. Department of Commerce, Co-Chair: Awards. Euro VAT Refund, Inc. was selected by the Los Angeles Chambers Southern California World Trade Week Awards Committee to receive the "2013 World Trade Week Service to World Traders Award". "After an extensive review of all nominations received, EURO VAT Refund Inc. has been selected because of their exceptional service and commitment to international trade,” said Carlos J. Valderrama, senior vice president for Global Initiatives at the Los Angeles Area Chamber of Commerce. 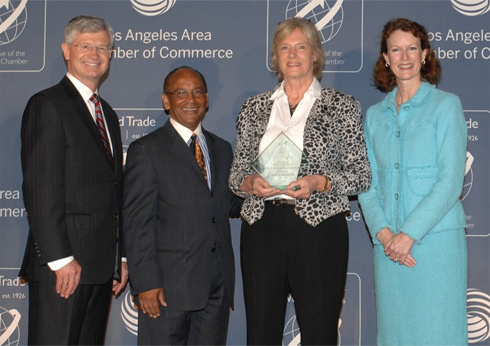 "Euro VAT is honored and pleased to receive this year's prestigious World Traders Award from the Los Angeles Chamber of Commerce," said Britta Eriksson, CEO of Euro VAT Refund, Inc. "As U.S. companies face challenges from the economic recession and increased global competition, it is important for them to effectively reduce expenses and not pay more taxes than required as a cost of doing business in Europe. Our company has extensive experience and expertise regarding the complex VAT laws and regulations of European countries, and can help companies minimize their VAT paid and maximize their VAT refunds." The prestigious award was presented to Britta Eriksson, CEO, Euro VAT Refund on Thursday, May 2, during the World Trade Week Kickoff Breakfast with close to 600 guests at the JW Marriott Los Angeles L.A. LIVE, Downtown Los Angeles, CA. If VAT has been paid on expenses within the European Union (EU) after January 1, 2012, the invoices should be gathered and sent to our office as soon as possible in order to meet the June 2013 VAT filing deadline. The filing preparation has to start as soon as possible due to the IRS certificate that has to be ordered which can take up to 3 months to receive. Please contact our office at your earliest convenience if interested in proceeding with a VAT refund. Czech Republic has changed their standard VAT rate from 20% to 21% on January 1, 2013. France confirmed that they will increase their standard VAT rate from 19.6% to 20%. The new rate goes into effect January 1, 2014. The Finish government has confirmed that their standard VAT (ALV)) rate will increase from 23% to 24% in January 2013. France Announces that the VAT increase from 19.6% VAT/TVA to 21.2% in 2012 might be canceled. There will no longer be a threshold for VAT registration when selling goods and products into the United Kingdom from December 1, 2012 for non-UK companies. Consequently all North American companies that import goods into the United Kingdom, or purchase from any UK vendors and sell on after December 1, 2012 are required to register for VAT. This means they have to register for VAT with the UK tax authorities, and charge 20% VAT to the UK customers. At the same time, they can deduct the VAT that has been paid to customs upon import, or to the UK vendors. If VAT has been paid on expenses in the United Kingdom (EU) between July 1, 2011 thru June 30, 2012, the invoices should be gathered and send to our office ASAP in order to meet the December 2011 VAT filing deadline. Please contact our office immediately if interested in proceeding with a VAT refund claim. The filing process preparation has to start now due to an IRS certificate that has to be ordered. This certificate can take up to 3 months to receive, but there is still a chance that some can be processed earlier, in time for the deadline. Actual invoices for VAT refund can be sent in later. The Spanish Council of Ministers has approved a Spanish standard VAT increase from 18% to 21%, and reduced VAT rate increase from 8% to 10%. The new rates go into effect on September 1, 2012. The Dutch Parliament plans to raise their standard VAT (BTW) rate from 19% to 21%. The change is planned to go into effect October 1, 2012. Many North American companies will have business activities in England in conjunction with the Summer Olympic Games of 2012 that are held in London, United Kingdom (UK). The UK has a VAT rate of 20% so it is important to plan any business activity ahead of time so the VAT paid hopefully does not end up as a cost but rather gets refunded. Note that sometimes VAT registration is required prior to the activity. This decision shall enter into force after the French presidential election if not disputed. The new rate goes into effect October 1, 2012. If VAT has been paid on expenses within the European Union (EU) after January 1, 2011, the invoices should be gathered and send to our office ASAP in order to meet the June 2012 VAT filing deadline. The filing preparation has to start as soon as possible due to the IRS certificate that has to be ordered which can take up to 2 months to receive. Please contact our office at your earliest convenience if interested in proceeding with a VAT refund. Ireland decided to raise their standard VAT rate from 21% to 23%. The new rate goes into effect January 1, 2012. The Italian government decided to raise their standard VAT (IVA) rate from 20% to 21%. The change goes into effect September 17, 2011. If VAT has been paid on expenses in the United Kingdom (EU) between July 1, 2010 thru June 30, 2011, the invoices should be gathered and send to our office ASAP in order to meet the December 2011 VAT filing deadline. Please contact our office at your earliest convenience if interested in proceeding with a VAT refund. The filing process preparation has to start now due to an IRS certificate that has to be ordered and this certificate can take up to 3 months to receive. Actual invoices for VAT refund can be sent in later. If VAT has been paid on expenses within the European Union (EU) after January 1, 2010, the invoices should be gathered and send to our office now in order to meet the June 2011 VAT filing deadline. Please contact our office at your earliest convenience, if interested in proceeding with a VAT refund. The filing preparation has to start now due to an IRS certificate that has to be ordered and can take up to 8 weeks to receive. The standard rate is increased to 8% (7.6%) and applies to most goods supplied and to nearly all services. Basic necessities, mainly food and drink (excluding alcoholic drinks), medicines and also certain newspapers, magazines and books, are taxed but only at the reduced rate of 2.5%. Finally overnight stays including breakfast are subject to the increased special rate of 3.8% (3.6%). 2. They may be able to arrange meetings and tradeshow without prior VAT registration in some cases. However, in most cases, VAT registration is still required. The rules will vary greatly from country to country, and it is very important to check at the planning stage for each event for each country. Please contact EuroVAT at the planning stage of your next event for the details. January 1, 2011 will witness a change in the Polish VAT rates to 23%. According to the Polish VAT Act amendments, the standard VAT rate will increase to 23% (currently 22%). The reduced VAT rate will increase to 8% (currently 7%). The 23% and 8% rates are to remain in force until 31 December 2013. The VAT amendment also introduces a new reduced VAT rate of 5%, which will generally replace the current reduced rate of 3%. United Kingdom will increase its VAT rate from 17.5% to 20% on January 4, 2011 to help with paying the country’s debt. The total minimum VAT reclaim amount is now 500 Euro if only one claim is submitted per year and 1000 Euro (per claim) if more than one claim is submitted per year. The EU “VAT Pack 2010” rules means that in general, no VAT will be charged on services invoiced from a European company to a North American company, starting in 2010. Examples of such services are clinical research, installations and repairs, and TV and movie productions. VAT will still be charged on other services, such as lodging and meals, tradeshows and conferences. There are exceptions to the rules. from July 1, 2008 through June 30, 2009 is fast approaching. Advance VAT registration required by many countries for companies to claim VAT refund.